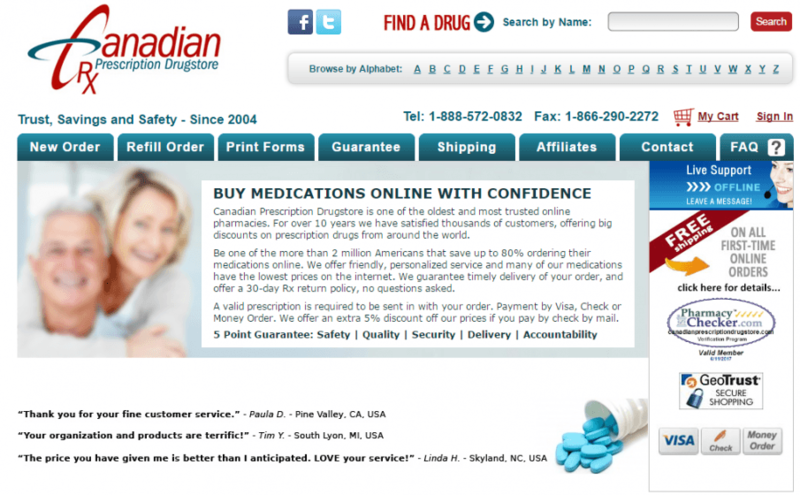 Canadianprescriptiondrugstore.com has been in existence since 2004. They claim to offer personalized service at very competitive prices. They are available for contact during business hours from Monday to Friday, 9am to 5pm. They are located in Vancouver, Canada. They sell both brand and generic drugs. Their products range from men’s sexual health to women’s sexual health, hair loss, sleep aids and so on. The average cost of generic viagra is $1.2 while generic Cialis sells for $0.7. This sure looks pretty cheap. A client must have a valid doctor’s prescription to order from this Canadian pharmacy. Your doctor’s prescription has to be faxed to the pharmacy using their printable prescription fax order sheet. The store can as well be contacted via their toll free customer care line. Payments can be made via visa cards, eCheck, personal check or international money order. New customers have the opportunity to get a free shipping for their first-time orders. There is a lifetime free shipping which costs $49.95, standard shipping costs $14.95 and it takes 15 to 20 business days for the orders to arrive, and expedited service costs $39.95 and order is sure to be delivered within 10 business days. International service as well costs $39.95. I tried using the live support option but I couldn’t because it kept pulling up a blank page. I wonder if that’s exactly the same thing experienced by other clients. This pharmacy accepts return of medications. This is the first I’ve come across. If within 30 days of receiving your order from your pharmacy, you wish to make a return of the medications, the pharmacy is willing to accept them though they expect that the return is made via US Postal Service (USPS) after you have contacted their customer service team to get a Return Authorization Number. In August 2016, a client named David gave a five-star rating to the CanadianPrescriptionDrugstore. He described the pharmacy as a “great place” to get prescriptions from. This was on the 13th. In that month, on the 11th, another client named Sheila gave the pharmacy a one-star rating. She said that after making an order, she waited for about a month, didn’t get her order and had to go elsewhere. It seems like Sheila wasted her time trying to order from this store. On the 10th of that same August, Janet was very dissatisfied with the customer care service. She tried calling severally and her calls were neither picked nor returned. She left messages and mails but got no response at all. I hope this happened before her ordering from the site because it would be really annoying if this happened afterwards. Ront Scott who used the pharmacy in April this year simply described them as a “great company”. 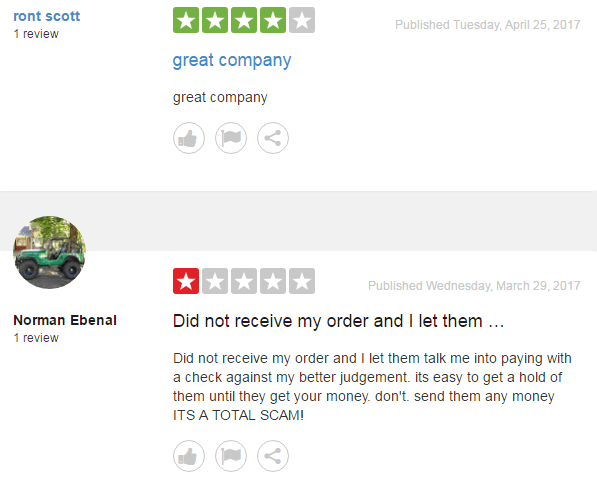 Another client named Norman Ebenal who had used the site in March said that he was talked into sending a check against his better judgement and didn’t receive his order. He described it as a “total scam”. Martin who used the site not so long ago seems to be a regular customer says that he always gets his orders and at very good prices. He, thought, complained that he could never reach anyone via calls and sometimes the orders are not delivered on time which makes him ascribe to buying locally. He gave the store a three-star rating which is pretty average. Jim who used the online pharmacy in August 2016 was pretty impressed with their services. He didn’t very well understand his prescription and received a call from this drugstore who helped explain the script and filled the prescription without any further delay. He vouches for the company saying that they can be trusted. This is a mix of great and not-so-great reviews which put me at ease sort of. 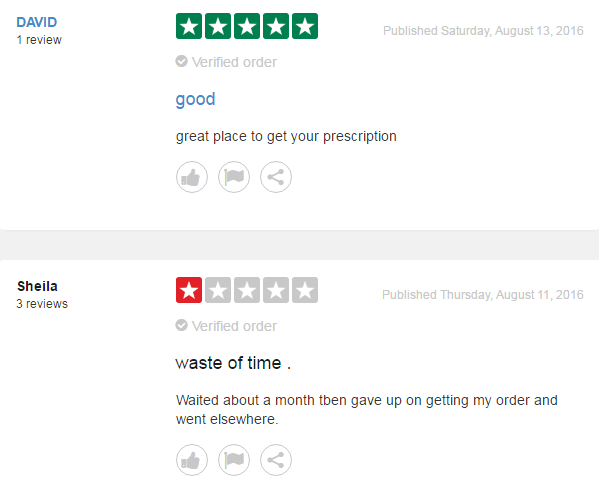 I would be suspicious if all reviews about an online pharmacy were good or if all were bad. Not all clients can be satisfied but the majority should be. First-time customers who order online get a free shipping for their orders. This is a good strategy to get new clients. It would have been nice though if there were other available coupons but I came across no other. Canadianprescriptiondrugstore.com seems like a pretty good pharmacy. It eradicates worries about defrauding to a reasonable degree and has pretty appealing prices. There is a common complaint laid by customers about late delivery of orders though some attribute to the fact that they actually get their product and at good prices. Not to forget, are the cases of customers who never received their orders. The calls that are never picked or mails that are never replied is a big problem as well because clients with issues might not be able to immediately contact the store thus pulling to the fore, a bad reputation for the store. This online pharmacy isn’t so bad from my point of view. I will give CanadianPrescriptionDrugstore a 3 out of 5. I can purchase my ED generics here while hoping to get them on time though I am still on the lookout for better pharmacies.